Private Bass Guitar tutoring lessons Woodbury, TN. Check out some of our most popular teachers near Woodbury, TN including Nashville, Mount Juliet, Brentwood, Murfreesboro and Antioch. Beginners: focus on learning the strings, frets and notes to play along with simple songs a la The Beatles, The Rolling Stones, Johnny Cash, Tom Petty, etc. Also focus on right hand and left hand techniques, peddling bass notes, rhythm and playing with percussion. Intermediate players: introduction to concepts like octaves, major and minor arpeggios, blues scale, sliding pentatonic riffs and circle of 4ths / 5ths. Incorporating these concepts by learning classic bass riffs like "Money" (Pink Floyd), "Billie Jean" (Michael Jackson), "Another One Bites The Dust" (Queen), "My Girl" (The Temptations), and "Like A Rolling Stone" (Bob Dylan). Introduce funk techniques like slapping, improvisation via major, minor and 7th chord arpeggios, reading music and studying players like Paul McCartney (Beatles), John Paul Jones (Led Zeppelin), Flea (Red Hot Chili Peppers) and others who are of interest. I have been playing guitar, writing songs and studying music for over 20 years. I graduated from Boston College with a degree in Music composition and theory. I am also a recording engineer and write music for TV, film and advertising. I love to teach and work with students who want to learn. Basically, I like to make music and have fun! I start by working on songs that are of interest to each individual student. Lessons are taught in my home. Seating for parents available. No pets. Bass and electric guitar amplifiers are provided as well as cables. I provide a guitar tuner and learning materials (i.e. music sheets and learning material). I expect the student to have a guitar, bass, banjo or ukulele to play. I also advise an amplifier for electric guitar students. I am able to bring a small practice amplifier to lessons at student location. On Guitar: Acoustic & Electric guitar, Rock n' Roll, Blues, Jazz, Improvisation, Merle Travis chicken pickin', slide guitar and music theory. In the world of audio recording, I am well versed in Logic Pro X. I operate Logic in my personal studio to write and record music for TV, film and advertising. P.G. is an awesome laid back teacher. His knowledge of music is amazing! He takes his time in guiding you and he really listens to you. He encourages you with positive feedback on your progress. I highly recommend P.G. for anyone wanting to learn to play guitar! I've been wanting to learn to play the guitar for a long time and finally decided to go for it. I chose P.G.B based on his extensive music background and am glad I did. 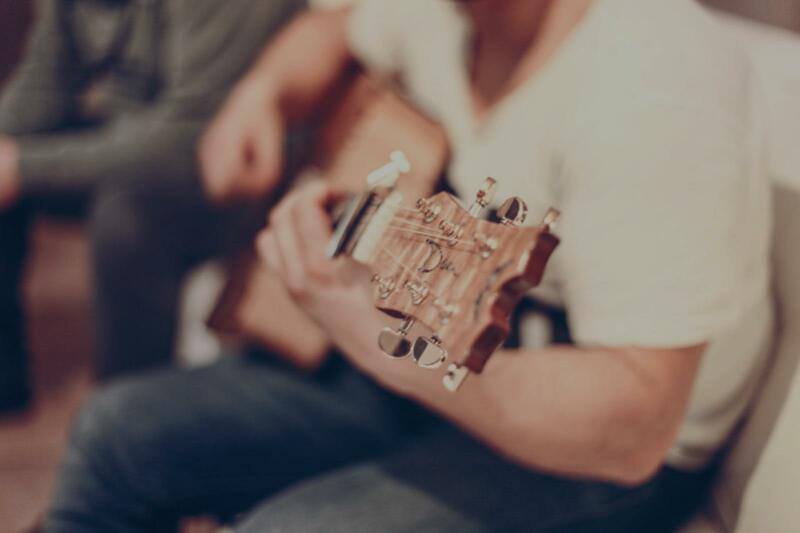 He's energetic, easy going, adjusts to your likes and learning style, provides excellent feedback, and motivates you be excited about learning the guitar. I've easily memorized a handful of chords and several songs already after only two lessons and we were even jamming in the second lesson. Can't wait to see how I'm playing in a month or two from now. I highly recommend him if you're wanting to learn guitar, he's makes it easy and a lot of fun. . I've been teaching Bass Guitar for 5 years and I let Students learn what they love. Within the first few lessons, you'll be able to play a song and as time goes on you'll be able to reach goals quickly. I specialize in Modern Styles, typically use a direct One on One approach, and have the following tools available for your lessons: Fender and Ibanez Bass Guitars. I love working with students of all ages and experience levels and I can't wait to meet you! I teach electric bass guitar using the Hal Leonard method. Also get students into learning songs, bass patterns and scales early in their learning. Bass guitar was one of those things I had a passion about for many years before I took it up. When I finally did, I explored the techniques of many of the great players like Victor Wooten and Jaco Pastorius. I have performed in several bands as the bassist, but I've most enjoyed studying it as a solo instrument while writing my own pieces and learning songs of great artists like Larry Graham and John Mayer. I typically play a 6 string bass but I'm happy to teach any type of bass from a 4 to 11 string instrument. I love teaching improvisation and special right hand techniques, so whatever path you want to go down I bet I can help you. I studied music therapy and music theory at Temple University from '06-'10. Learned a lot. Then again, I learned even more teaching at a school for kids with learning disabilities and working as a traveling street performer. Once you see the world and work with some unexpected challenges, you learn how to open up and knuckle down at the same time! lues Raga video if you want to hear a good story about what I mean. Once basics are covered special attention is paid to chordal theory and how to use it. We will also work on technique as needed. The goal is to have you ready to gig in a very short time. I have been playing music for over 30 years, and have been teaching music for almost half of that time. I have performed and recorded throughout the Midwest in a variety of cover and original bands ranging in styles from metal, rock, to R&B/Jazz and Blues. I teach these styles as well. The most important thing for me as a music instructor is to get to know the student. I then tailor the lesson in a way that will resonate with the personality of the student. Finding the right balance of technique, theory, and fun, my goal is to have the student leave the lesson eager to go home, practice and come back for more. All ages and skill levels are welcome. Greg is a great men also a great teacher, when i first meet with Greg for my first lesson that i known i will be learning by the great teacher. I took lessons from Greg when I was much younger say 12-13 for a year or more. He taught me a lot and had me playing guitar really fast, I always tried to do what he asked and he never ever got frustrated if I did it wrong or couldn't play what we were learning right away correctly!. Also all of what he taught me stayed in my head all these years some how and I kinda progressively got better and better!. I'm pretty happy with my playing and a lot of others are to!. Greg has something special about his students and teaching them to play the guitar correctly no matter what or how long it takes, he cares about you as a student. You get out what you put in ,but be patient cause it also takes time. But you'll see the difference later down the road that Greg was the right teacher for learning to play and the theory behind the guitar.....I recommend him as a great guitar teacher!. I myself take lessons from him again at the age of 38 , I was able to find him on Facebook after all these years and we do lessons via Skype, I'm a very happy student, very happy!. And I thank Greg Gladman for that!. He has taken his time with my son and they have made great success. He goes at a speed that is adaptable as my son progresses. Friendly safe environment to learn. He has so many guitars and other instruments to help the learning process. Playing in all styles of music , music reading theory and composition. The bass guitar is such an underrated instrument, but without that sub frequency, music would not feel the same! Everyone wants to learn guitar, but it takes a special person to play the bass. If you are up for the challenge, I can lead you down the Bass Guitar path. Hi my name is Nick and I am a multi-instrumentalist, audio engineer, and composer. Music is a passion in my life and nothing makes me happier than to see others enjoy it as much as I do. Music is one of the most important things in my life. If I am not playing, writing, or recording music, I am usually trying to discover new music to listen to. With half my life dedicated to writing and performing music I received my degree in audio engineering from the Conservatory of Recording Arts and Sciences in 2010. When i am not teaching private lessons locally, I am currently a Kinder - 5th Grade Elementary Music Specialist in my public school district. /Synth, Drummer, and Lead Vocalist. I have a soundcloud page with material from my past bands and I have an EDM album "Neuro Method" on iTunes and Spotify that I wrote, produced, and recorded in 2012. I currently have students learning guitar, bass, drums, piano, ukulele, and recorder. If you are looking to start something new, relearn something you forgot, or take your music to a new level I can help lead you down the right path. Travis is an upright and electric bassist and music educator, born in northern Michigan and based in Minneapolis, Minnesota. He holds a BA in performance from Mcnally Smith College of music and has studied with world-renowned bassist and bass educator Joe Hubbard, as well as Anthony Cox (Joe Lavano, John Scofield), James Anton (Johnny Lang), Terry Burns and Gary Raynor (Prairie Home Companion). He is accomplished on double bass, 4 and 5 string electric bass and is known for his ability to perform in a multitude of musical styles including, but not exclusive to jazz, rock, country and musical theater. As an educator Travis provides over 20 years of performance knowledge coupled with the experience of over 30,000 private lessons taught to create a clear cut, no nonsense approach to learning the bass guitar. in Stillwater Minnesota with his wife Andrea and son Miles where he currently performs an average of 200 shows per year as a freelance bassist in the twin cities area. Travis was on staff as a bass instructor at Mcnally Smith College of Music for 11 years and currently teaches at both Western Wyoming Community College and Carleton College in Northfield Minnesota. I have never had a teacher who is so helpful and fun to practice with. Travis has taught me more than I have learned with anyone else and he has made it by far the most enjoyable structured music learning I have done in my entire life. I would highly recommend Travis no matter your skill level! Really great teacher with a system that adapts well to anybody's needs. I already read and play other instruments, and he's really good at finding the spots where I need to improve - technique, but also playing styles of music that I don't already know much about. He's working on a set of method books that are really adaptable to so many situations - learning the fretboard, learning to read tabs or notation, learning to create your own bass lines. Travis is a terrific teacher and I wouldn't be a fraction of where I'm at musically without his guidance and lessons. Couldn't be happier with the learning process and lessons I am given and the progress I see week after week. Can't find a teacher in Woodbury, TN? "Matt is super talented at bass and a great teacher! Love learning from him." Nashville, TN teacher: Matthew F.
uitar and I compose music for documentaries, etc., but I wanted to play live shows with a friend’s band, and I wanted to learn as quickly as possible. The cool thing is: I think Hayes has helped me improve, all around, as a musician, and as a composer. Nice guy, versatile, and knowledgeable. I definitely recommend him!" Nashville, TN teacher: Hayes H.
its never a dull time! I feel much more confident in my ability to pluck a bass and would recommend him to anyone at any level of playing ability." knows and understands his instrument well and is very motivational when teaching new beginners." "Extremely knowledgeable, patient and makes learning the bass fun and easy." Nashville, TN teacher: Evan C.
Nashville, TN teacher: Rachel C.
how me how to get off to a quick start and then be able to add to my skills as I keep playing. I would recommend him highly!" "Rachael is excellent at recognizing my learning style and customizing her teaching method to best communicate key concepts to me." "I've known Matt personally for about 7 years. He's super-personable, patient, and knows his stuff. I wouldn't hesitate one bit to recommend him!"